Essential vitamins for the growth, development and maintenance of healthy skin, bones, vision, teeth and reproduction. Treats rickets (childhood Vitamin D deficiency disease) and osteomalacia (adult rickets). Prevents night blindness. Builds resistance to respiratory infections. The active forms of Vitamin A are found in animal tissue, whereas the pro-vitamin or precursor forms, such as Beta-Carotene, are found in certain fruits and vegetables. Vitamin D plays a dual role as both a vitamin and hormone. 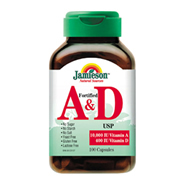 Vitamin A and D are essential micronutrients. Each capsule contains: Vitamin A 10,000IU, Vitamin D 400IU.